It’s been a few weeks since we’ve taken the trip to my parent’s new place in Colton, OR, but I’ve finally been able to catch up with enough things to get back to documenting this project. The most exciting part was when Alyssa and I met Art Graham, owner of M. Graham paints. 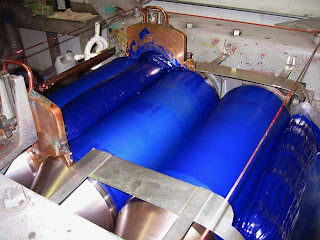 In addition to some invaluable tips that he had for my project, he also showed me how they made paint, and as luck would have it, they were making my favorite oil color when we visited; Ultramarine Blue. If you would like to learn more about the best paints I’ve ever used, I’ve devoted an entire page to the visit. 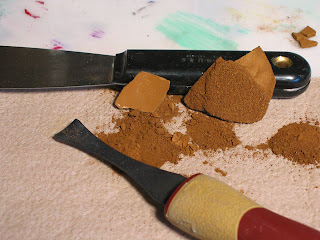 Many earth tone pigments are literally that: they come from dirt. 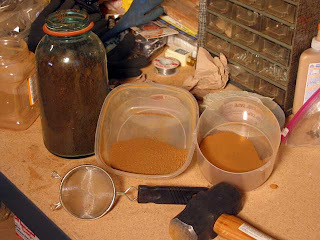 Now, the pigments that any professional paint maker would use are going to be a lot more refined and have a much, much higher level of quality control and consistency than I’ll be able to come up with, but it is reassuring to know that I can actually use that beautiful red-clay color from my parent’s property in my work. The suggested way to do this is to filter the earth and remove any inconsistent particles, then crush it repeatedly. Afterwards, mix it with water and let it settle. The finest particles will settle at the top. Skim these off, and repeat the process. When done, I should have a substance about as fine as talcum powder, which can be mixed with the medium. 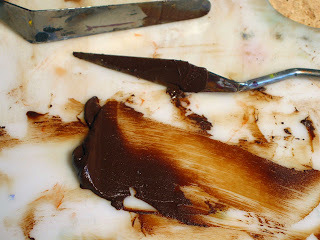 Black & White Pigments: Am I Willing to Kill an Animal for this Project? 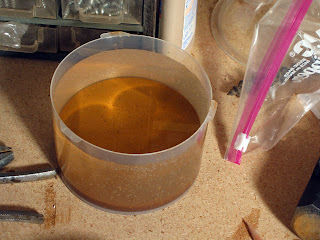 Art mentioned that I might want to try pulverized chicken bones for white pigment. Apparently, the earliest tempura paints were made from egg yolk and ground chicken bones. Also, if I can burn the bones properly, I may also be able to get a really good black from them, too. This brings up a question that I’ve been wrestling with for a while on this project: am I willing to kill an animal for art? I think it will be a lot more justifiable if the rest of the animal is used too, but except for slugs, spiders, flies, mice and a few very unfortunate barnacles, I can’t say that I’ve ever killed anything. It’s funny how something that our race used to do to survive now brings with it such a moral dilemma. I’m going to experiment first on bones from leftovers. That at least delays my decision on black & white tones for a few more weeks. For walnut oil, I could do what Leonardo Da Vinci did: boil the walnuts and skim off the oil. Oxidized copper. I’ll see if I can find any copper ore on or near my parent’s place. If it’s off the property, I’ll have to see if someone is willing to trade it for labor, or perhaps something I’m already growing. 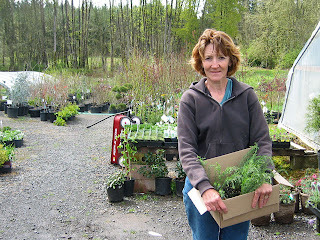 For Easter, we visited my family, who had just moved into their new property (40 acres near Oregon City). 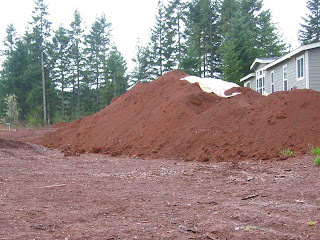 Most of the property’s soil is a deep red clay. 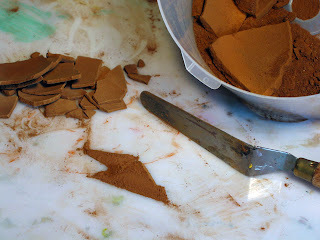 This soil is what reignited the idea of this art project in my mind. 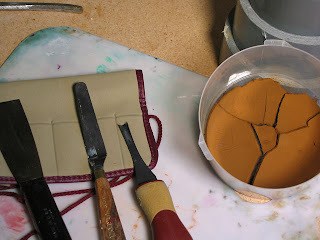 I thought that it might make a nice pigment. As luck would have it, when we visited, my sister’s foundation on her new house was being installed (my sister, her husband and kids live on the same property), and there was a huge mound of dirt from which I took samples. 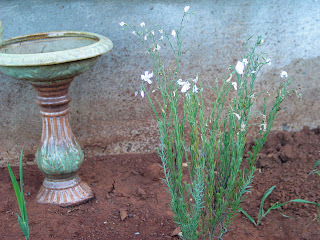 While I was there, I was able to do a couple of tests on the soil. As I didn’t have time to finish them, I smuggled some back to Canada with me. 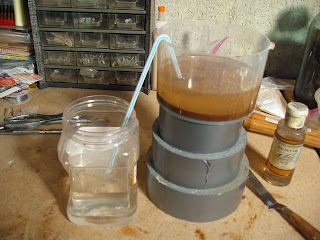 But, I was able to create a slurry (i.e. mud) and let the contents settle. 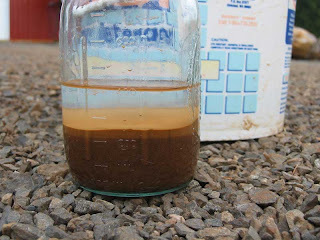 There turned out to be a fair amount of silt on this particular sample. 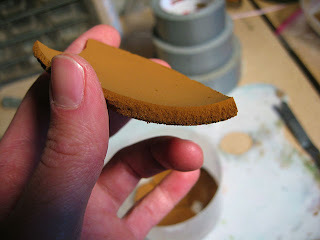 The idea is to use the silt as a pigment. 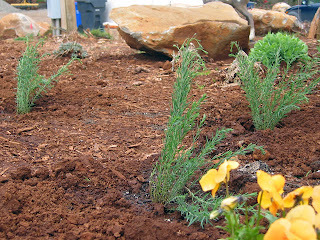 More on this soil and my results up in Canada on the next post!